Poofy Organics has been on my “approved” list for several months, after it was suggested I check out the line by someone on my page. Looking them up in EWG put a huge smile on my face, as did reading several of their labels. EWG lists 115 products rating 0-3. You have to scroll a really long way to get past the products that rate at 0 (nearly 2 pages) to even find ones that rate at 1, only 7/115 they list rate at 2. And, as always EWG is not all that up-to-date, and I noticed several products listed that aren’t currently offered via Poofy’s website. Indeed, the 4 products that EWG rated at a 3 have been eliminated from Poofy’s line! There are no harsh preservatives to be found, the ingredient lists are minimal, and the array of organic ingredients used in each product is astounding. I liked what I saw & added them to my list. But, I hadn’t tried any of the products, so was always hesitant to recommend anything specific when asked for recommendations for frequently asked questions such as shampoo/conditioner, etc. I am SO thankful that Kristina, the owner of Poofy Organics (and one of the 4 employees in addition to her mother) agreed to send me several samples. I’m well aware that companies such as Poofy get multiple requests a day for product samples from bloggers such as myself, and would go broke if they agreed to all of them. Kristina knew she could count on me to give my honest opinion of her products, and that you all place great value in my reviews, so she agreed to send me several samples! The amazing thing about dealing with a very small company like this is any time I had a question (and I ask a LOT of questions! ), Kristina had them answered beyond satisfaction within hours. She knows everything there is to know about these products. Why? Because she makes them herself. I wish I could say the same for experiences I’ve had with other companies. I’ve had questions go unanswered for a month as the person selling them is so far removed from actually making them. So, here’s a list of products I was sent, their ingredients, prices, and my thoughts on them. Followed by additional info on this company and their products that I enjoyed learning about, and hope you will too. Dish Soap– A safe, effective dish soap is one of the most FAQ I get on this page, and I’ve been very frustrated with the options, even the safest ones have ingredients of concern. The ingredients in this are fabulous, and it works SO well The 1st time I tried it was with a tiny sink of dishes, just to see how it worked. I did the dishes, went outside for an hour or more, and came back & there were still bubbles in the sink! Then I let the dishes build up to the point where I had 2 sinks full and put it to the test again, the bubbles lasted through the whole load, and it was a pretty greasy load too! Last night hubby did dishes & without me asking for feedback he said “Wow, this stuff gets them squeaky clean”, and it really, really did. The dishes were so clean, no leftover grease or grime that I’ve experienced with some of the more eco-friendly brands I’ve tried. I cannot recommend this highly enough, and hope many of you are as excited as I am. Ingredients: Purified Water, Saponified Organic Oils of Coconut, Olive & Jojoba, Decyl Polyglucose ( EWG rating of 0! ), Organic Vegetable Glycerin, Organic Apple Cider Vinegar, Xanthan Gum (EWG rating of 0), Organic Aloe Vera, Organic Essential oils of Lemon & Rosemary, rosemary extract. Price=$10.00/16 oz. bottle. Many brands say just use a tiny amount, but I always find myself squirting quite a bit in for desired effect, but you honestly just need a little squirt of this stuff. AND, it has a wonderful, clean, fresh scent! he Xanthan gum and Decyl Polyglucose are from non-gmo corn and the glycerine is USDA organic from soy. Conditioner– $15 for 8 oz. I was sent the Hair Hero Intensive conditioner. As the name implies, it’s very intensive, and not recommended for everyday use. If you have wonderful, healthy hair, this may be too much for your needs, but if you have dry/damaged hair, this is the one for you! This works well with my hair washing routine which stems from my No Poo experience, which is washing it just a couple times/week. Also, $15 may seem expensive, but HONESTLY, you need a teeny, tiny dab of this stuff, any more & you’ll have greasy hair. I literally use a pea-sized amount, rub it around in my palms a bit, and gently finger it through the ends of my hair. I did recently chop my hair to shoulder-length though, so you’ll need a bit more with longer hair obviously, but still this will be the most minimal-use conditioner you’ll ever use. It leaves my hair feeling so soft, healthy & shiny-looking, I truly love it. I was also sent a spray/leave-in conditioner which is different from the one they are currently offering. The current formula was a bit greasy, so Kristina reworked it to make it less greasy, and appropriate for kids & adults alike. I’ve only sampled it a couple of times but loved how my hair felt after drying. It was soft, yet not oily or greasy whatsoever. Kristina is putting the final touches on this product & it should be available in the next month- I’ll surely let you know when it is! Ingredients for Hair Hero Intensive Conditioner: Distilled Water, Organic Safflower Oil, Organic Avocado Oil, Organic Olive Oil, Organic Grapeseed Oil, Organic Argan Oil, Organic Jojoba Oil, Organic Unrefined Shea Butter, Organic Vegetable Glycerin, Emulsifying Wax, Organic Rosemary Extract, Leuconostoc Ferment Filtrate (Kimchi Seaweed), Organic Lemon essential Oil, Organic Rosemary Essential Oil. Argan Oil– 100% pure & raw, USDA organic. $30 for 2 oz glass bottle. I’m totally new to this product. I’ve been seeing it pop up more & more in products recently, and recommended often by others, so was very happy when this item was sent for me to review- I always love to try new products as long as I have no concern over their ingredients/source. I’m assuming many of you are as unfamiliar with this oil as I am/was, so here’s some info on it that I gleaned from Poofy’s site: “The Argan, a Moroccan tree exist no-where-else in the world! Very rich in essential fatty acids, vitamin E and more, AO is famous for its pure natural hydrating and revitalizing properties. An anti-wrinkle product that is made by mother nature.” They give many suggested uses for it: revitalizing oil for face and body, strengthening soft & brittle nails, emollient (capillary mask for beautiful hair), massage therapy, and I’m sure there are plenty of more uses for it. I have mainly been using it after washing my face before bed as a moisturizer. YES, it is expensive. BUT, it comes with a dropper, and you honestly do just need a drop here & there. I put a drop on my finger for under each eye, 2-3 drops on my chin/neck, and a couple of drops for the rest of my face. I’ve used it in my hair a few times after shampooing with no conditioner. I let my hair dry, drop 3-4 drops of the oil in the palm of my hand & lightly run my hands through my hair. It does a wonderful job taming dry, winter, static hair. Sunscreen– $14 3.4 oz tube– SPF 30. Safe for the whole family! The only other sunscreen I’ve used on my babe, on the occasion when covering up isn’t practical, is Badger Balm. Poofy’s sunscreen is very similar to Badger’s, both contain non-nano particle zinc (a must!). The one difference that many of you who’ve tried Badger will like is that Poofy’s isn’t as thick so it applies easier & smoother. Spring has been very, very late in arriving here in Wisconsin this year, and I’ve only sampled this on my babe once so far when we went to the park for a few hours on a nice day. As it was some of his 1st sun exposure of the year I was nervous about him turning pink quickly. He kept his hat on for 1 hour, and the other hour I left the hat off to let him absorb some Vitamin D, and applied the sunscreen to his face, which didn’t turn even the slightest shade of pink. I will update my post on this as summer finally gets here & I have more occasion to sample it, but I have no doubt it is an effective, safe sunscreen that I have no hesitation recommending. Ingredients: Organic Jojoba Oil, Organic Unrefined Shea Butter, Organic Beeswax, Organic Virgin Coconut Oil, Organic Camellia Oil, Organic Cocoa Butter, Zinc Oxide, Organic Rosemary Extract, Organic Eucalyptus Essential Oil, Natural Vitamin E.
Bug spray– $10 for 2.8 oz. I know many of you live in climates where you do have pests year-round, so wanted to bring this option to your attention. I live on the banks of a river and it’s just a matter of time before mosquitos are a real issue here. I will update this post & let you all know as soon as I’ve had a few opportunities to put this to the test. I can tell from the ingredients that it should be an effective, yet very safe option for our families! Ingredients: Organic Sunflower Oil, Organic Peppermint Essential Oil, Organic Lavender Essential Oil, Organic Lemongrass Essential Oil, Organic Grapefruit Essential Oil, Organic Eucalyptus Essential Oil, Organic Geranium Rose Essential Oil, Organic Clove Essential Oil, Organic Rosemary Essential Oil. Kristina loves making new products, and I have samples of a couple more products en route that she would like feedback on. I’m excited to try them out, and be part of this growing line of great products. Other categories of Poofy Products, with several options in each category: Holiday Gifts & Baskets, Baby & Mommy, Bath & Shower, Body Butter, Lotion, & Scrubs, Cosmetics, Deodorant & Toothpaste, Eczema Relief & Natural Remedies, Essential Oils, Facial Care, Hair Care, Henna for hair & body, Lip Balm, Nail Polish & Remover, Soap & Sanitizer, Sunscreen & Bug Spray, and their I AM goddess line. *They actually have 3 lines, with a teen line in the works! The I AM Goddess collection is a direct sales/middle-level marketing/home party line, I’m sure you’re all familiar with this idea. Here’s what Kristina had to say about this approach: “So far, with our Direct Sales portion, we have 12 DIVAs- they are doing a great job spreading the word… we do not have all the same products in the I AM goddess collection- it is much smaller in comparison to POOFY… it’s just that at the time, people were asking to do parties, so I gave in”. For $150 you can buy a starter kit & get started selling these great products from home! Are these products only available online? The do have one retail location in Rutherford NJ. Otherwise you will find them stocked in select Whole Foods locations on the East Coast, and they also have outlets in 6 states (one in WI even, I’m hoping to make that 2 as I work to get the line on the shelves of my food co-op!). This may lead you to believe this is a large company. 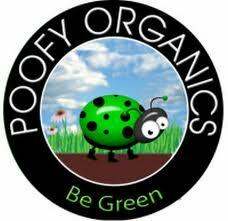 Poofy Organics has only 4 employees 2 of those being Kristina (the owner) and her mother. Which leads me into my next topic which I absolutely LOVE about this company. Most people think only huge companies can take the necessary steps to become organic certified. Not true. Poofy Organics is a great case in point that anyone with enough determination can make this happen. It’s not an easy process, but one I’ll gladly support by paying a couple extra dollars per product to reward. The following paragraph discusses why they decided to go for the certification, and there is a fabulous article attached that discusses what the entire process entails. As you can tell, I’m VERY impressed with the products & the company philosophy of Poofy Organics. This line truly has something for everyone. I hope you found this info useful & it will help you when making future decisions regarding safe products you need for your family. For more info, please visit their Website and/or Facebook page. they carry enough different colors to cover light white skin to darkest skin colors. You can also mix your own. What is great is you can buy sample packets for low price do you aren’t stuck with something that doest match. I had tried bare minerals and was dissatisfied esp with color values this just blew it out of the park. They encourage you to make your own and offer classes. Can buy individual minerals and make your own colors. I bought a color I liked use it on eyes blush add to lipgloss base use it on lips and added it to nail color base and had matching colors and I knew what was in everything. I don’t wear lots of makeup but this is only stuff I use. At work I use to do mini makeovers (nurse at night) when slow even did someone who never used makeup and just left her looking natural just more radiant. She loved it.